This stylish 6 Mukhi Java bracelet strung in double turn stretch elastic gives the wearer youthful appearance, focus and better control of emotions. 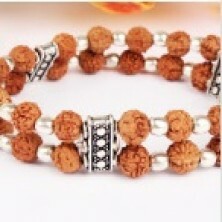 The proficiently designed bracelet with silver spacers has 6 mukhi Java beads which are approx. 8 mm in size and uniform. Wearing procedure: For first 3 days, wear it from morning to evening so that the beads are attuned to you. After that the bracelet starts working as soon as it is put on. You may wear it for a minimum of 3-4 hours daily. On days when you cannot wear, keep it in a clean place or pouch. The 6 Mukhi Rudraksha gives the wearer a youthful appearance and fulfillment of desires. It represents Lord Karthikeya and gives the wearer qualities such as focus and fearlessness. It is governed by planet Mars which controls anger, survival and stability. The 6 Mukhi can be worn for removing laziness and dullness and attaining grounding and perfection.